Buddhists, Jews, Christians, Muslims, and atheists are welcome here, as are gay, lesbian, transgender, and heterosexual people. Republicans, Democrats, socialists, Marxists, Tea Party members, communists, unreconstructed Southerners, and Yankees are welcome here. Our doors are open to men, women and children, whether Chinese, Japanese, Native American, European, Mexican, African, Canadian, Puerto Rican, Caribbean, Russian, Australian, or Korean, North or South. We do not care one bit how you wear your trousers, what color you are, or how you do your hair, even though sometimes it is difficult not to find these things interesting. We do not allow guns, cell phone use, or smoking—indoors or on the balcony. Yelling and running are prohibited (except in our children’s store, where we are unwilling and unable to stop it). We do not allow profanity or other language that may be offensive to other customers. In spite of what some of our lawmakers may lead one to think, people in Mississippi are among the nicest, most hospitable people in America. If you are anyone, from anywhere, we hope you will visit us, and we hope you may find something you would like to read. Because our stores are relatively small and we can not afford to have all books, our decisions about what books we have in stock are based on what we believe our customers might want to purchase. If you do not find the book you want, we will be glad to get it for you. 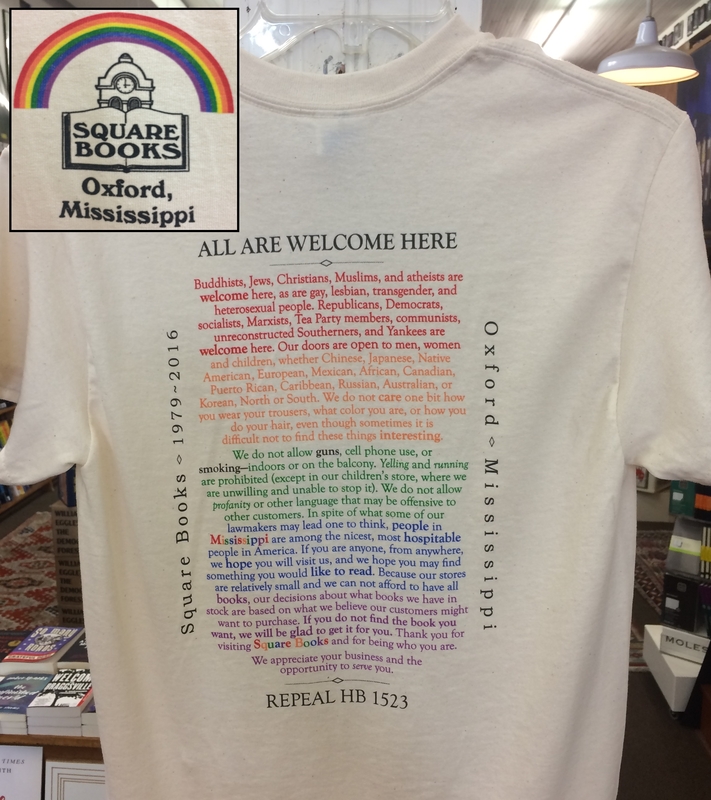 Thank you for visiting Square Books and for being who you are. We appreciate your business and the opportunity to serve you.